I had the pleasure of speaking at WordCamp Atlanta in March on the lessons I learned taking a plugin from a casual .org submission to a paid product. 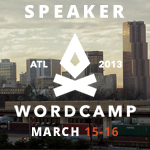 Watching @NaomiCBush's presentation from WC Atlanta on WordPress.TV. Love her style, great conversation. Great talk today at #wcatl by @NaomiCBush about her journey creating and supporting a premium plugin. I like her style! @NaomiCBush loved your talk at #wcatl and your approach to shared value/incentive for the plugin world. #wcatl @NaomiCBush is smart, funny & too humble. She's the creator of the awesome Stripe Payments/Gravity Forms plugin GravityPlus Pro. Listening to @NaomiCBush share her experiences with us. She is a great storyteller.